A few weeks ago we discussed venture capital — or the lack thereof — in Kansas City. An article by Richard Florida showed that the vast majority of venture capital is concentrated in coastal metros. Kansas City barely registered on the map. In a follow up article, Florida looks at venture capital on a per capita basis and our friends in Lawrence show up very well. In fact, Lawrence ranks sixth in the nation, with more than $40 million in venture capital investments per 100,000 residents. 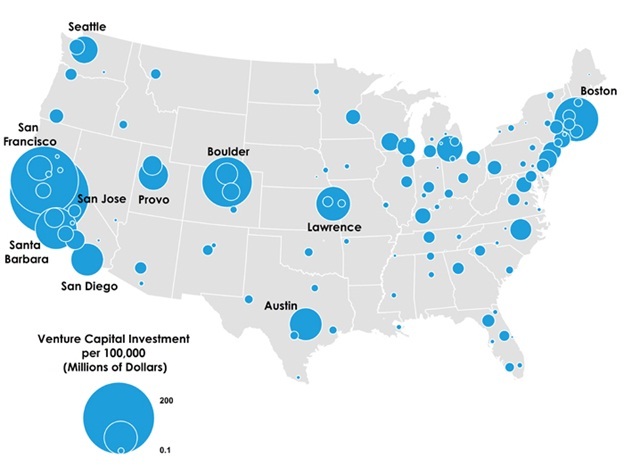 The map underscores a not-too-surprising relationship between venture capital investment and major universities, with metros like Boulder (home to the University of Colorado), Austin (University of Texas), Boston (Harvard, MIT, Boston College, etc.) and Provo (Brigham Young University) all in the top 10. The upshot to this map is that while venture capital may be concentrated on the coast (particularly the Pacific Coast in this per capita analysis) there are still islands of venture capital in other places. Perhaps venture capitalists are broadening their reach to find investment-worthy innovations. This may indicate that a good innovative idea, even one hatched in Kansas City, can find the funding it needs to become a reality.